In the same way “wine enthusiast” is a fancy way of saying “wino.” The thing is, I’m too old to be a “nerd.” I’ve got kids. I’ve got a mortgage. I can no longer eat Jack in the Box monster tacos. And I know I’m not alone. So I’m giving all fellow nerds over the age of 34 a promotion. From this day forward, consider yourselves “pop culturists.” Update your LinkedIn profiles appropriately. Now the best part of being a pop culturist is we’re the easiest people to shop for during the holidays. We’re collectors. We love nostalgia. We obsesses over the obscure minutia of geekdom. So for you, and more importantly, the significant others who shop for you, here are some ideas that will make Christmas Day for the pop culturist feel like, well, Christmas. The first thing I ever truly desired in my entire life was a “Star Wars,” C-3PO action figure from Woolworth in Kahala Mall (like I said, I’m mature). It was gold and shiny and it was a 3 ¾ inch piece of the coolest movie I ever saw. Ripping open that blister pack was my gateway drug into geekery. 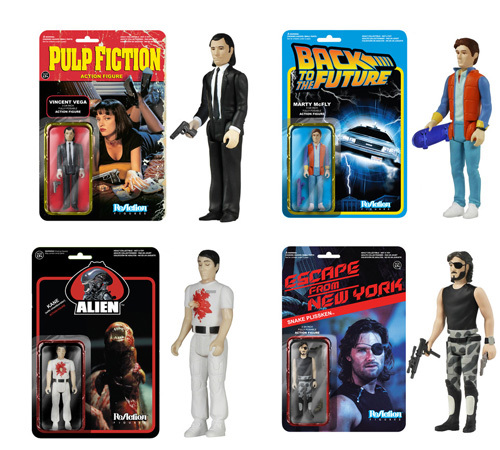 Well, Funko has brought back the magic of those action figures with its line of ReAction Figures. Done in the Kenner “Star Wars” style, these are the toys from movies you wanted but never had. Marty McFly from “Back to the Future.” Chunk from “The Goonies.” Even the Gimp from “Pulp Fiction.” You can find these online or at Gecko Books in Kaimuki. The true pop culturist will want to collect them all. Did you know that the certified Gold, “Awesome Mix Vol. 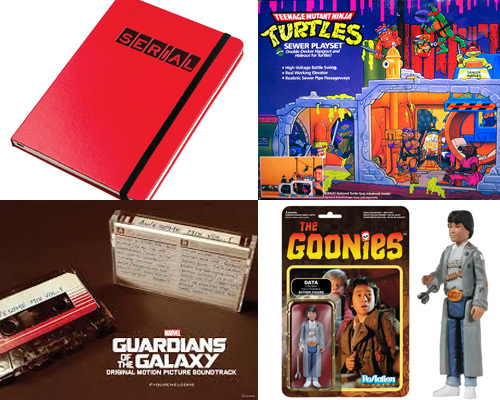 1” soundtrack of “Guardians of the Galaxy” was actually sold as a limited edition cassette tape? This special promotion was released on Record Store Day on Nov. 28. Needless to say, these cassettes are very rare — a plus for the pop culturalist. Jelly’s Hawaii told me Oahu only received one cassette. ONE. So head to eBay and be prepared to drop around 40 plus bucks. Now if you could only find something to play it on. If you haven’t caught up on “Serial,” the podcast phenomenon of the fall, please stop reading, apologize and start downloading now. This true-crime story brought to you by the storytellers of “This American Life” dissects the case of Adnan Syed, a high school kid convicted of murdering his ex, Hae Min Lee. But did he do it? 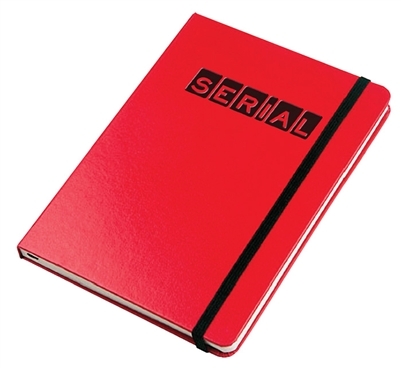 For the “Serial” fanatic, This American Life’s website is selling a “Serial” notebook to keep your darkest secrets. This is the perfect journal to admit into evidence in case you too are mysteriously murdered. It’s a USB phone charger. 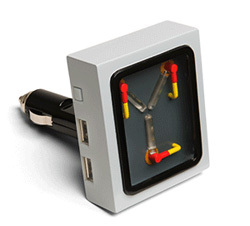 It’s a Flux Capacitor from “Back to the Future.” It was nerdy in 1985, and it’s nerdy now. If you’re willing to buy this for your significant other, you’re a keeper. If you’re willing to ride in the car of your significant other with this thing plugged in the dashboard, put a ring on that finger. Nothing says I want to look smart than a fine leather-bound book on our bookshelf. For the binging “Orange is the New Black” fan, the Easton Press is selling a leather-bound edition of the book that inspired the series, signed by author Piper Kerman. Imagine that. A book on your bookshelf that you’ll actually read. Remember that toy you wanted as a kid but never got? For me it was this “Star Wars” Death Star playset. I really wanted to play with that trash compactor. Well, if you watch the Travel Channel show “Toy Hunter,” you know these collectables are worth hundreds and even thousands of dollars today. Jordan Hembrough, the “Toy Hunter” himself, sells his rare finds on his Hollywood Heroes website and eBay store. So if you really want to give your beloved pop culturist a Christmas to remember, give them a piece of their childhood back. If there’s some treasure your significant other really wants, from a Castle Grayskull to a Ninja Turtle Sewer Playset, go to the Hollywood Heroes website and send Jordan and email. Just be warned. Childhood isn’t cheap. Fellow pop culturists, what are some of the awesome items on your Christmas list? Tell me in the comments below. Merry Christmas!